PFA provides a complete pole reinforcement installation service to utilities, councils, and private property pole owners. PFA supplies pole reinforcement product and hardware to third parties. PFA offers two proprietary systems. PFA’s Pole Reinforcement products provide an extremely efficient and economical way of extending the life of any wood pole asset, be it a power pole, a lighting tower, a communications pole, a bollard, or a pole-based structure of any kind. PFA can reinforce and extend the life of any wood pole for a fraction of the cost of pole replacement, and in a fraction of the time. PFA’s MultiTube is a significant leap forward in pole reinforcement technology. With its simple design using circular hollow sections, the MultiTube is strong, unobtrusive, and smooth-edged to the touch of pedestrians or stock. Many thousands of PFA’s MultiTubes are in service today. PFA’s MultiRib is an excellent product that utilises two stiffening rib sections and is made in various sizes depending on the application. The MultiRib has been in use since the early nineties, and is a tried and proven performer with tens of thousands still in service today. As a wood pole ages, it can suffer from deterioration and/or damage. For this reason, electricity network poles are required be inspected at intervals no greater than 5 years to ensure adequate safety standards (see PFA inspection services). Where poles are identified to suffer from excessive deterioration at or below ground line, PFA’s MultiTube or MultiRib can be used to bring the pole back up to serviceability standards. 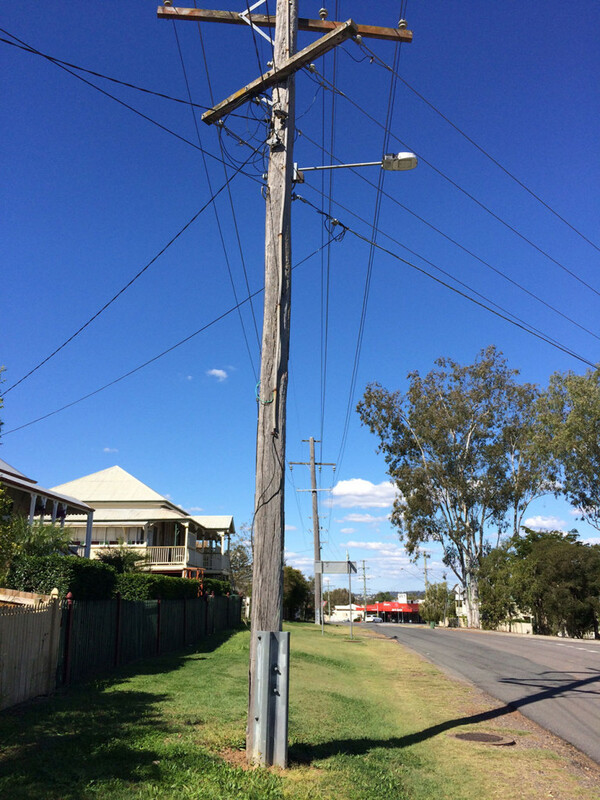 Ground line deterioration weakens a pole and can end in pole failure, whilst high winds or storm events can expedite failure of a weakened pole. A fallen pole represents extreme danger by exposing people, assets, stock, and surrounding areas to catastrophic risks such as fire or electrocution. It’s not just the power that goes out! Pole reinstatement is used when wooden poles (180 mm to 475 mm diameter) are affected by ground line rot, which would otherwise require pole replacement. it is more economical than replacement and works on a fixed price basis. Strength is maintained or enhanced for an additional 20 to 30 years!